Test Knits: The Adventurer Beanie - Say It, "Rah-shay"
Every so often there will be a call for pattern testers on Instagram. 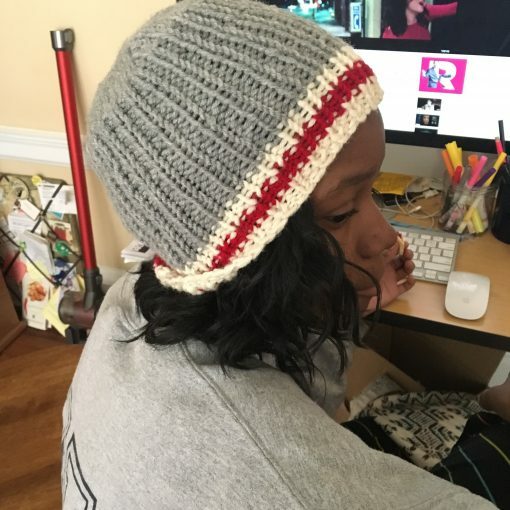 I saw such a request for testers to knit up a hat called “The Adventurer Beanie from Zuri, aka 12littlethings, , and I volunteered as tribute er…tester. Because I thought I published this before (I did not?!) I am sharing now since this hat was easy and fun to work up. 1. It didn’t take that long to work up, a little over an hour and a half including weaving in the ends. My hope is that future knitting this hat will not take quite so long. Since I was testing I wanted to make sure I followed the directions properly. 2. For yarn I used Lion Brand Lion’s Pride Woolspun. It’s a bulky yarn so it works up very quickly. It is soft and squishy and warm. This yarn does not pill up and does very well squished in the bottom on a backpack. If you are interested in following Zuri or getting a copy of The Adventurer Beanie, visit her shop on Etsy or check her out on Ravelry. As always, I can be found on Instagram as “Sayitrahshay” or we friend me on Ravelry!